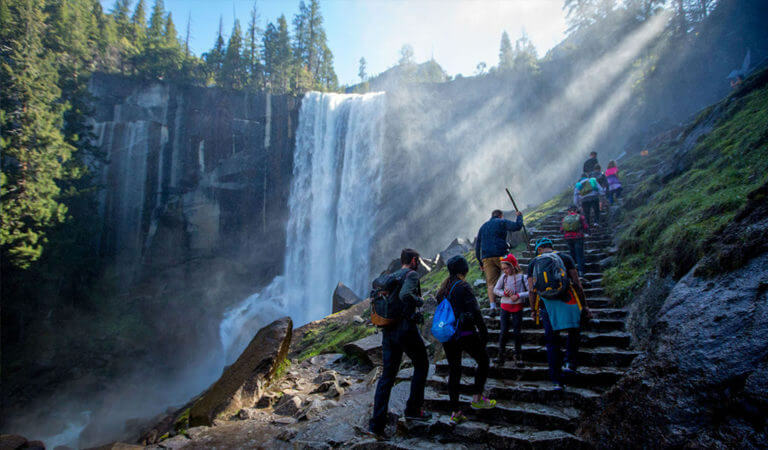 Whether you’ve been to Yosemite a hundred times or just drove in for your first stint, Yosemite offers more than 1,000 square miles to hike, camp and enjoy breathtaking waterfalls. Knowing this, it’s no surprise that this National Park gets quite a bit of foot traffic. With summer in full swing, families, international travelers and locals alike are heading to Yosemite to take in the magnificent landscapes. In a single year, more than four million people will visit Yosemite National Park. Needless to say, knowing the park’s most popular trails along with the trails less-traveled will help you plan your perfect visit. Yosemite sees the most visitors between Memorial Day and Labor Day– June, July and August. In the spring (April, May, June), park visitors will enjoy bountiful waterfalls and budding wildflowers, while the fall (September, October, November) will entice patrons who favor the changing of the seasons and the subtle yet beautiful color shift throughout the park. As the sun bathes the forested areas, you may smell hints of vanilla and butterscotch coming from the Ponderosa or Jeffery pine bark as it heats in the autumn sunlight along with the more classic pine scents emanating from the variety of evergreens. If you’re interested in exploring the amazing forestry Yosemite has to offer, don’t miss some of the most majestic trees you’ll ever encounter at any of the three sequoia groves (Mariposa Grove, Merced Grove, and Tuolumne Grove). To share views of these awesome giants with less people, head to Merced Grove trailhead. It has a fewer number of trees but you’ll be rewarded some solitude to take it all in. For the ski bums, there is Yosemite Ski and Snowboard Area. In February, don’t miss the spectacle of Firefall at the Horsetail Fall where, specific to this time of year, the sunset hits the waterfall just right making it glow hues of orange and red. Do note when visiting in the winter, some roads and trails in Yosemite are closed due to snowfall but there is plenty to see and do regardless. At the higher altitudes, snow might make its first appearances as early as October. Check out updated road conditions, to see what trails and closures are typical for the winter months. If you’ve done your research or have been dreaming about visiting Half Dome since you can remember, then maybe you already have a few spots you’re dying to go. Yosemite’s most popular hikes are by far Half Dome, Yosemite Falls and the Mist Trail, this being of course for the epic views. There’s nothing like it. Because the scene is so iconic, you can expect many others like yourself are going to want to see the same views, too. 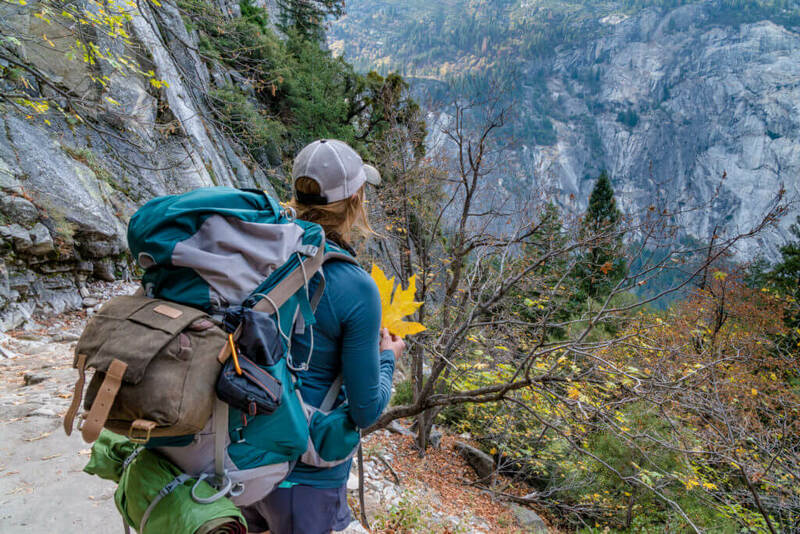 If you’re looking for hikes in Yosemite this summer that are less traveled, we recommend heading to the Yosemite Valley Loop Trail. Although the Valley is always the most crowded region of the park, this path will allow you to reach some more secluded areas away from the bigger crowds but still have that special valley perspective where you’re looking up at all the mammoth granite structures. Here, you can knock off some of your bucket list views like Yosemite Falls, and a quick detour will land you right at Sentinel Rock. It’s an easy hike that can be done in half a day, or, be explored for the entirety of your trip, but don’t forget to bring a map! The trailhead for Taft Point and Sentinel Dome is located on the north side of Glacier Point Road, about 2 miles before the road ends at Glacier Point. The views at Taft Point are not for the faint of heart, especially if heights aren’t necessarily your cup of tea, but the quiet scenery and gorgeous panoramas will take you far from the more popular and crowded trailheads. Sentinel Dome on the other hand will likely not make anyone too nervous while still offering an amazing 360 perspective at the top. Try to avoid the hottest times of the day if possible. Start early and get back in before noon or head out closer to the evening to avoid overheating or dehydration. 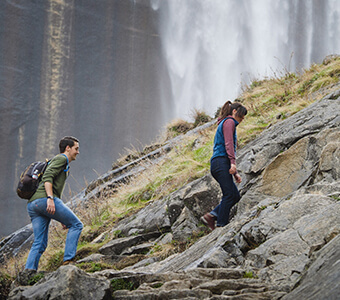 Summer outfits for hiking will vary, as the weather likes to change. 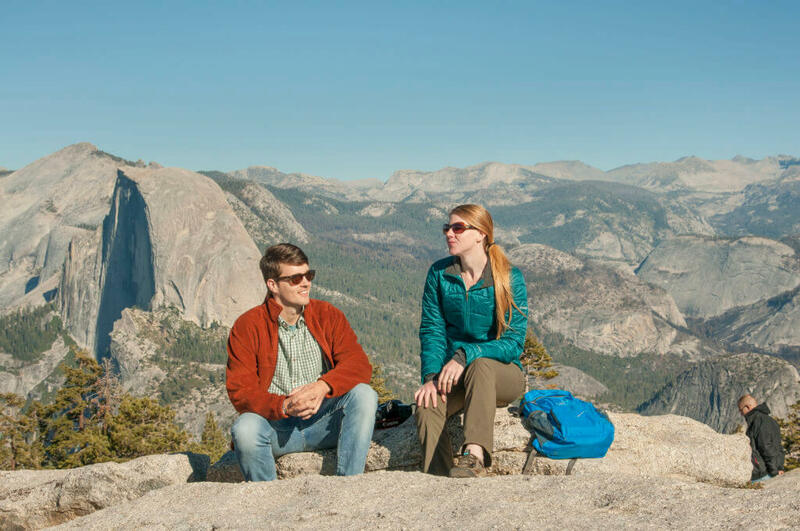 Yosemite has what’s known as a “Mediterranean climate” meaning warm days and cool nights. Try to dress in layers in case of surprise thunderstorms or a sudden drop in temperature. Summer hiking boots (typically day hiking boots that will range from mid- to high-cut) meant for light loads and don’t require a lot of break in time. Two pairs of hiking socks, at least. 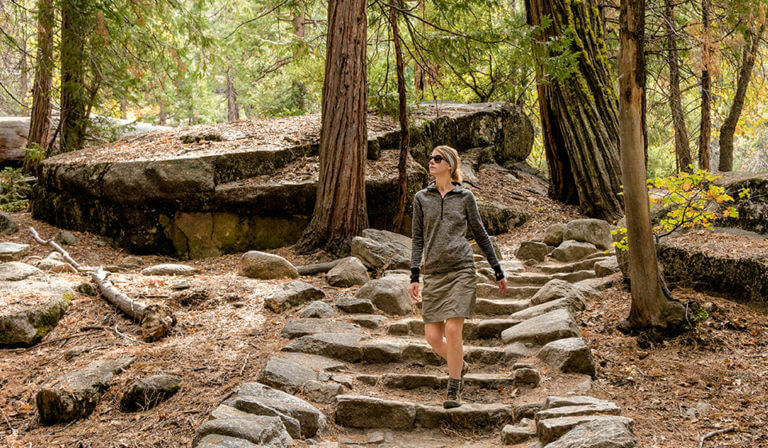 Choosing the right summer hiking outfit for Yosemite and the right summer hiking boots will make the difference between a trip to remember and trip you could potentially have to recover from. No one likes nursing blisters! 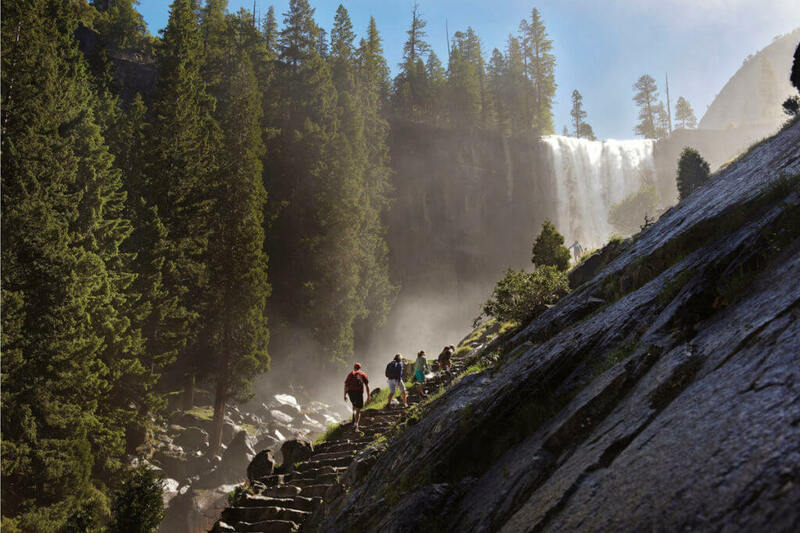 Discover the park’s most popular hiking trails including the less-traveled trails that many don’t know about to plan your perfect trip to Yosemite. Yosemite National Park is home to many incredible attractions—but what really drives visitors to make their way to Yosemite? The chance to see one of Yosemite’s famous waterfalls.